San Francisco-based Capella Space announced it has closed $19 million in second round venture funding. The company plans to put a constellation of 36 small radar satellites into orbit to provide all-weather, all-time imagery from anywhere on the planet within an hour. The Series B investment round is lead by Spark Capital and DCVC (Data Collective) and joined by Mark VC and Harmony partners. Funding for the round will finance the first operational launches of the company’s radar satellites designed to deliver high-quality imaging from orbit. The first Capella test satellite launch is scheduled for November 2018 as a part of the Spaceflight SSO-A rideshare mission. Capella Space is one of several U.S. companies developing small synthetic aperture radar (SAR) satellites for the commercial market. 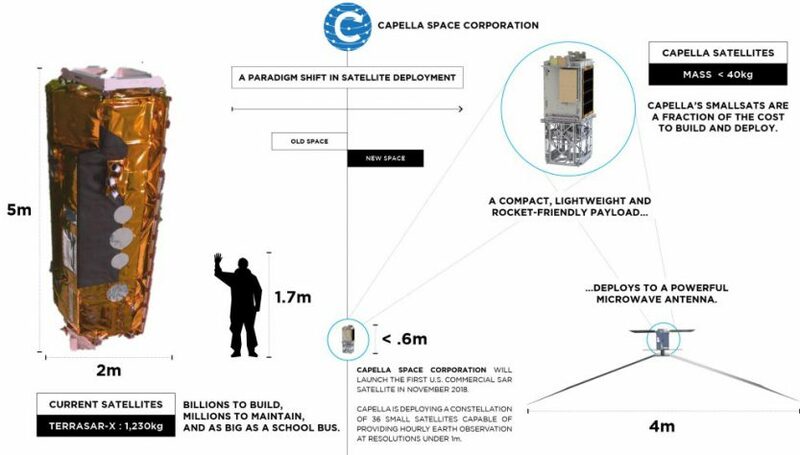 Capella’s satellite is the size of a backpack on launch, combining efficient electronics and what the company calls an “origami-like” antenna that unfolds to almost 100 square feet. The combination delivers “effectively” the same image quality as radar satellites the size of a school bus and the company says its first-generation system will provide resolution of 0.5 meters using X-band radar. Launch of the first operational satellites delivering imagery for paying customers is expected to take place next year, with the full constellation composed of 12 planes of 3 satellites each, producing SAR imagery of any place on Earth within an hour or less. The constellation will end up generating terabytes of data per day, adding to the masses of information being collected by other imaging firms. Traditional electro-optical (EO) satellites using visible light can’t see through clouds and see much less at night. SAR uses radar to “see” in all weather and lighting conditions, plus can penetrate the ground to see buried or hidden structures and objects, such as pipelines and water for irrigation. Capella Space says it has already lined up tens of millions of dollars in pre-sales commitments from commercial and government customers, with the U.S. Department of Defense saying it will pay up to $11 million towards development and getting timely imagery. Radar provide the unique ability to track everything from large ships down to tanks and missile transport vehicles in any weather and at any time. To date, Capella has raised a total of nearly $34 million, with its series A round at $14.5 million. At some point, the company will have to raise more funding to build out the rest of its 36 satellite constellation. Capella Space isn’t alone in the SAR satellite constellation world, with 8 or more companies planning projects. Finland-based ICEYE raised $34 million in its most recent round of funding and plans to launch up to 9 radar satellites by the end of 2019, having successfully demonstrated its technology earlier this year. U.S.-based XpressSAR and Umbra Labs are also working on SAR constellations.